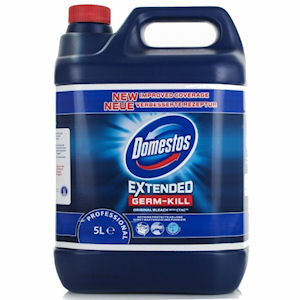 Domestos has protected office toilets from harmful germs since its conception in 1929 when it started producing liquid bleach. Here at Zepbrook we stock the original bleach in multiple sizes - with the larger 5 litre bottle of Domestos Original Bleach offering great value for money for larger offices. 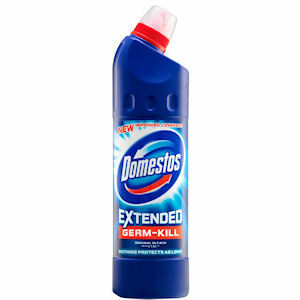 Get your Domestos bleach from Zepbrook tomorrow: order before 5pm if you're in London (or the M25 area). 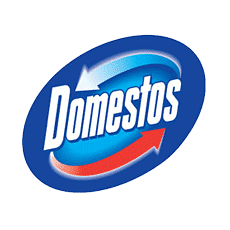 Do you need Domestos products that are not currently listed on our website? Contact us - we can source and deliver many other products for a competitive price. Call us now on 020 8752 0110 or enquire online. Germs usually come back after your toilet is flushed. But not with Domestos Extended Germ-Kill. Thanks to its formulation with CTAC, it clings for longer than any other bleach. And that means it keeps every toilet safe from germs for longer.